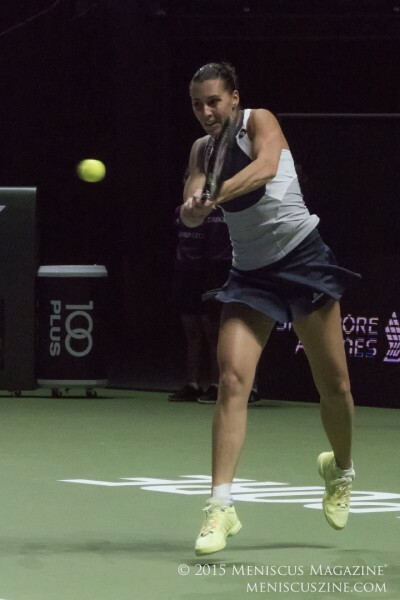 As a result of her singles trophy at the U.S. Open, Flavia Pennetta qualified for the first time for the year-end WTA Finals. It also ended up being her last tournament as a professional tennis player. 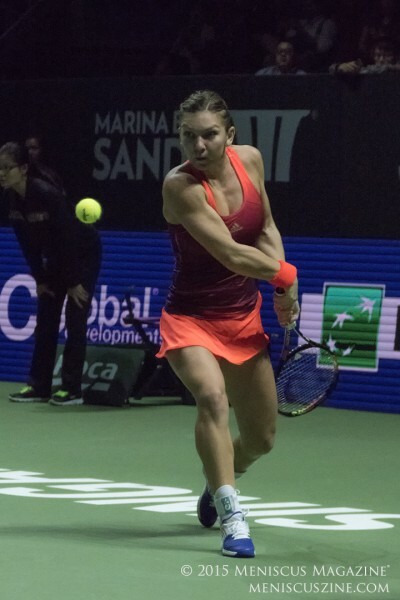 The 33-year-old Italian amassed a 1-2 record in round robin play, losing to Simona Halep (6-0, 6-3), defeating eventual champion Agnieszka Radwanska (7-6, 6-4), and then bowing out of the tournament with a 7-5, 6-1, defeat to Maria Sharapova. The final press conference transcript of Pennetta’s career, provided below in full, is courtesy of FastScripts by ASAP Sports, while the photos are from her first match against Halep. Talk about what happened today. Played pretty well. Close in the first set. After that, kind of went down a bit. 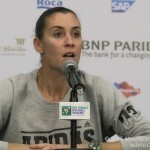 FLAVIA PENNETTA: Did you see the match? 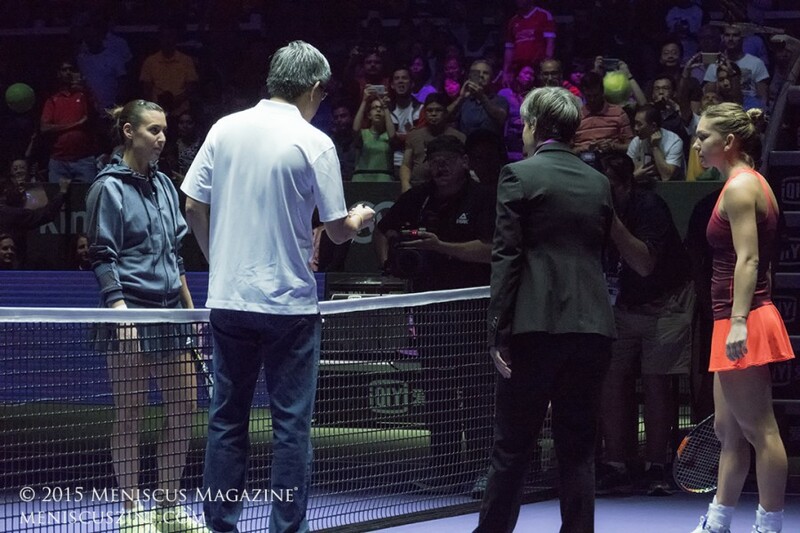 FLAVIA PENNETTA: Did you see Maria, how she played today? Yeah. She’s a good player. Won a few slams. But about you, last match. 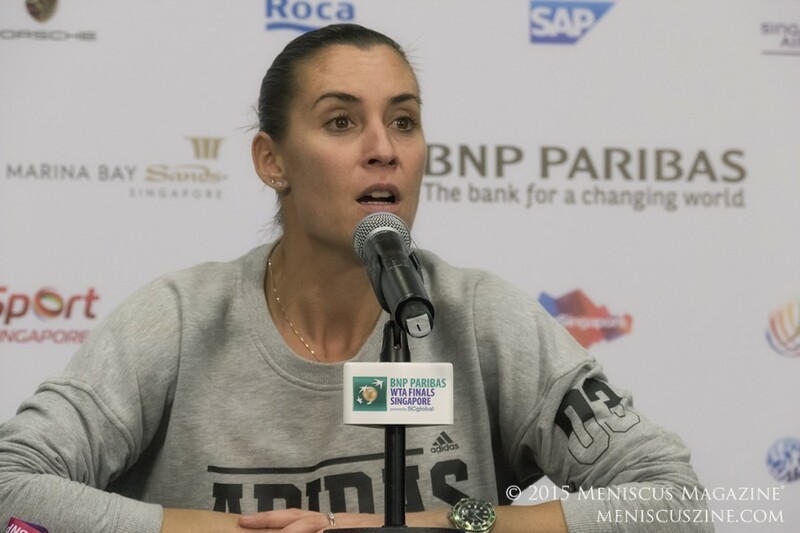 FLAVIA PENNETTA: I was playing I think really well. First set we play really well. I just has one game in the 4‑3 where I play a little bit worse. I had two double fault, and so I lost my chance I think on that game. But I think was really good game. She play unbelievable. I didn’t remember see Maria playing so good and serving so good from ‑‑ I mean the second set was perfect for her doing everything, dropshot, volley. Everything was work good for her. I think was good day for her. And was good day for me also. I think I play a good tennis also. Flavia, your emotions? I guess this is the last match, or so you say. What are you feeling? FLAVIA PENNETTA: Normal. (Laughter.) I don’t know. I feel really good. I’m happy to have the chance to play this tournament. I think to have the last match against Maria was amazing play such a good champion. Was a good way also to say good‑bye, because when you lose against such a good player there is not too many things to say. What will you miss the, most do you think? FLAVIA PENNETTA: I think I will miss ‑‑ I mean, the players in a way it’s like a family. We know each other since long time. Doesn’t matter if you talk or be friend with someone more or less, but every week you see the same face, you see the same person. It’s going to be different to don’t see them anymore in the same way. Of course I will see them because I will going around a little bit, but it’s not going to be really the same thing. But I cannot tell you what I going to miss more than that. I think also I will miss the competition. When you go on the court, the central court, it’s something special. I don’t think I will have it anymore. But in the other way, I am really happy to start a new part of life, new things. Why did you leave the court so quickly? I know you probably were disappointed you lost, but I think the fans would’ve liked you to say good‑bye to them, if you like. 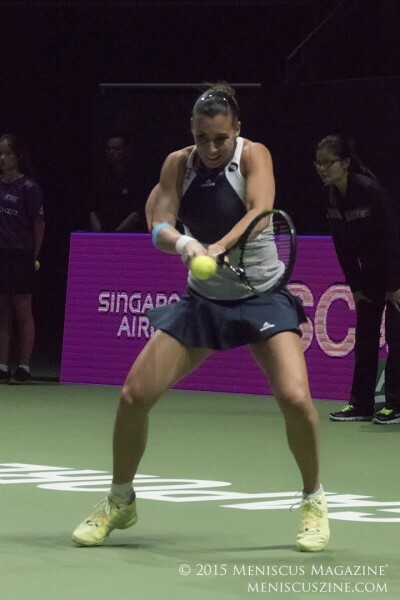 FLAVIA PENNETTA: I was not able to do that. I prefer to ‑‑ I don’t want any drama. I don’t like drama. I wasn’t able to do that, so I prefer maybe to do it in few months. I don’t know, maybe in Rome or wherever. What are you proudest of in your career? Not in the sense of winning a tournament but in the things you’ve done and your persistence, your struggle. What are you proudest of? FLAVIA PENNETTA: I’m really proud of to be strong all the time. I had so many injuries, so many stop in my career. I had to start few times from nothing. And again and again. I think that part of my life, it’s really important. Just try again starting from zero, starting to train and be focus again and mentally, that’s so difficult when you stop for a long time and then come back after big injury. For sure that is the most important part of my career. I’m really consistent also outside the court. I’m really ‑‑ I have my routine. It’s always the same thing. I’m really professional on that. 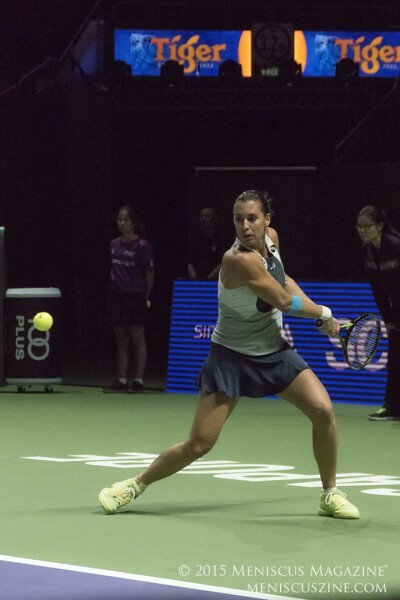 FLAVIA PENNETTA: I think it’s good for ‑‑ it’s good way to see the career of a player. I mean, of course it’s much better if you have everything quickly and when you are younger. But in the other point, I think it’s also a good way to see like doesn’t matter how many time you fell down, you can always be back. So this is a good thing for the young player. You know, when you win, when everything is so easy, the life, it’s great. But when sometimes, I mean, you go down and you have to start again. Excited to come India for the Champions Tennis League? FLAVIA PENNETTA: Yeah. I was in India in 2007 the last time, so I will come with my sister. I think it’s going to be nice to see a little bit the country, because I was just once in Hyderabad and once in Calcutta. We going to see something different. Of course it’s going to be a good trip. So as a player, when you go on to the court you don’t know whether you’re going to win or lose, but for you you didn’t know whether it was going to be your last match or not. That’s a very unique position. What were those moments like before hitting the court? FLAVIA PENNETTA: Well, didn’t know it was my last match because if I just win one set I was able to play also Saturday. So I didn’t think about the match or my last match or nothing. I was focus to play. Also maybe just in the match point I say, Okay, this is the end. Before the match or during the match, nothing. I mean, it’s so strange because I feel like so normal. I don’t know. Si, it’s more the rest. I mean, my family, my friends, I receive so many message from my friends already. And for me it’s something easy. So your last professional match is against Maria Sharapova. Do you think that’s a great way to wrap up your career? Could you have asked for a better competitor? FLAVIA PENNETTA: No, I can’t. I think she’s one of the best of ever. She’s a good person. Also like in the court, I mean, today she was perfect in so many aspect, I think. How surprising is it, as somebody who has come back from injury or whatever, basically been out for four months and comes out and looks like she’s on top of the world? FLAVIA PENNETTA: I mean, it’s strange, I have to say. Before the tournament I didn’t expect to see Maria so focus and so good and everything. Sometimes it’s good to stay away a little bit. You recover and you have more energy. You come with more ambition. So sometimes you need to stay away for a while. So for her, of course it’s working really good. Flavia, I think you were the only player in the tournament that had a winning record over Maria before tonight. You said how much of a fabulous champion she is. Does that make you very proud that you retire with such a good record? FLAVIA PENNETTA: Yeah, of course, of course. But, I mean, I didn’t think about the record and these things right now. Was just good to play against her. I try my best. I had my chance. In the first set I didn’t make it, but of course it’s good to go home against her for sure. Out of interest, where do you keep your US Open trophy, and have you ever seen a tape of your US Open final match? FLAVIA PENNETTA: I didn’t have yet my US Open trophy. It will come in Christmastime. And I don’t know where I going to put. I think in Barcelona where I live. And if I see all match, no, just the last point. You spent the week with the top eight players and also the doubles team as well. Just wondering if you could share any nice moment that you had with any of the other players here. FLAVIA PENNETTA: Not really. I’m here with all my family, with some friends, so I was with them all the time. But what about just generally looking back on your career? Do you have kind of a story that sticks out in your mind? FLAVIA PENNETTA: My best friend in the tour was Gisela [Dulko] when she was on the tour; Francesca [Schiavone]. The person that I still in touch all the time, I mean, I was talk with Francesca yesterday and Gisela two days ago. I mean, I have good friends in the tour and good friend around the world, so it’s really nice. What were your best match wins ever for you? Just a couple. Not just one. A few. FLAVIA PENNETTA: One really nice that I really love is in Rome against Nadia Petrova. At that time was Pallacorda now is Pietrangeli. She was No.4 in the world and she was kill me, like 6‑2, 2‑0 with full crowd. No chance to win. I don’t know how, but I won 6‑4 in the third or something like that and was amazing, because the crowd there was unbelievable. Like a soccer match. I never had something like that before. You were pretty young then, no? FLAVIA PENNETTA: Yeah, I was young. I can’t remember the year. I remember she was No. 4 in the world. Other matches, final, the final in New York was really nice.